The delivery drones may never get off the ground, but that’s beside the point. 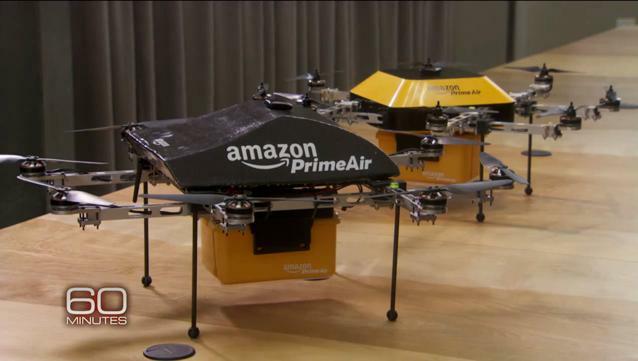 Amazon.com Inc. (AMZN) founder and CEO Jeff Bezos and CBS did a fine job hyping a promised “surprise” on “60 Minutes” Sunday, revealing a nascent plan for an Amazon Prime Air fleet of unmanned “octocopters” to drop packages gently on the doorsteps of customers. The idea may or may not fly, and if it ever does it won’t be for years and many FAA studies and logistical work-arounds. Yet the real point of Bezos’ expert playing of the network-media game was to drive home his constant and zealously emphasized point about Amazon’s mission: we do everything to make products cheaper, and life easier, for our customers. This is how Amazon justifies its refusal to reap significant profits from its dominant online retail bazaar, as most every dollar earned is recycled back into shipping centers and server farms. It is how the company defends itself from charges that it is systematically putting smaller retail competitors out of business. As I discuss in the attached video with Yahoo Finance Editor-in-Chief Aaron Task, nothing Bezos told Charlie Rose on “60 Minutes,” in what amounted to a long corporate promotional video, was news to investors or to anyone who has followed Amazon since it went public as an upstart online bookseller in 1997. Bezos long ago persuaded Wall Street that its refusal to charge more for products - its decision to pursue profitless prosperity in the service of selling everything the world has to offer – was a winning long-term strategy in an electronic retail world that rewards scale and speed. Its shares, to the eternal consternation of skeptics who adhere to traditional fundamental analysis, are up more than 26,000% since its IPO, and have doubled in the past two years. Bezos repeated, as he frequently does, the claim that Amazon’s internal “price-elasticity” studies always conclude the company should raise prices. His refusal to follow the pricing models’ advice is simply a way for an enormous, imperial company to wear its customer-friendliness on its sleeve. He’s probably right that being known for the best price engenders deep customer loyalty over time. But it’s also very good PR, as is Bezos’ ostentatiously humble claim that he fully expects Amazon to be “disrupted” by newer competitors over time, and he is merely trying to forestall the decline that ultimately befalls most every company. The delivery-drone “reveal” of course produced immediate buzzy chatter in social media, with mockery of safety concerns colliding with wonder over the extreme convenience such a service would represent. Maybe Bezos wanted to prompt just such an excited response. Related: How Paper Towels Could Be Key to Amazon’s Growth: Will Lower Prices Follow? Perhaps he prefers the conversation surrounding his company to be about its efforts to challenge even the rules of aviation and law of gravity to make his customers happier – rather than, say, his mention that the company’s Web-services business is building a “private cloud” for the CIA to use for its data needs. What’s beyond doubt is that the glimpse of the drone plans was a highly strategic, calculated gesture of openness by a company that generally prefers to divulge as little as possible about its operations or intentions. Bezos refused even to acknowledge to Rose specific plans for another device, such as a new set-top box, that would appear far closer to fruition than octocopters touching down on front lawns.